I love seltzer, but I don’t love spending money on bottled seltzer and carrying 50lbs of it home at a time. I recently bought a CO2 tank and regulator for the keg at Crushtoberfest, and I’ve been looking for other uses for it ever since. *** unfortunately you sometimes have to buy 10 packs (or more) from McMaster. You can get individual hose clamps from your local hardware store. I drilled a hole in the cap (#10) that was just big enough for the threaded end of the coupling socket (#8) and assembled them together with the nut (#9). I used teflon tape in between parts 6 and 7. 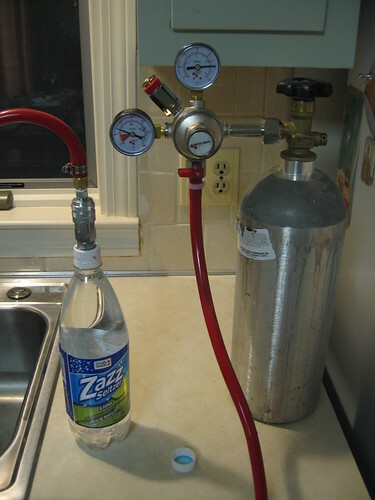 I also use my CO2 bottle for a keg when necessary, so I got a second set of part 6 and 8 and attached it to the hose coming from the keg tap. This way I can connect and disconnect from one system to the other. One thing I learned, and this is VERY IMPORTANT: Apparently there is a chemical reaction between the CO2 dissolved in water and copper (or copper alloys like brass) that creates a toxic substance that will make you sick. Never use brass or other copper-based fittings with seltzer! All of these fittings (or at least the ones that will be in contact with the seltzer for any length of time) are either zinc-plated steel or stainless. The carbonating process is simple. Fill an empty bottle with the liquid of your choice and refrigerate it. Replace the cap with the special one you made and attach the quick-disconnect hose to it. Make sure the shutoff valve on the regulator is closed, then slowly open the main valve on the tank until the regulator shows pressure. Adjust the output pressure to about 45psi and open the shutoff valve, pressurizing the bottle. Now loosen the cap on the bottle just slightly while squeezing any air space out of the neck of the bottle, then tighten the cap. This will purge any air from the bottle and replace it with CO2. Now shake the bottle vigorously for about 20-30 seconds; this will help dissolve the CO2 into the liquid faster. 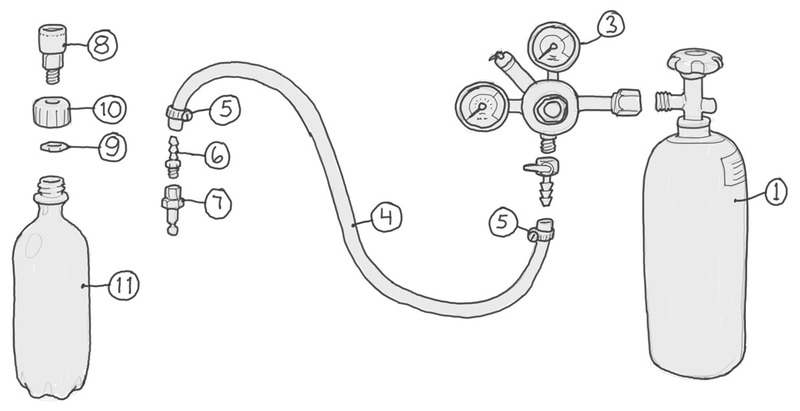 Shut off the CO2 at the regulator and disconnect the hose from the quick-disconnect fitting. You can now remove the special cap (slowly, the contents are now carbonated!) and replace it with a regular cap. So on the first day I made seltzer water. On the second day I carbonated apple juice, grape juice, and Gatorade, and ended the evening with a carbonated vodka martini (nice!). What else can I carbonate?